And so, after five days of running drills, fielding drills, hitting off live pitchers, and hitting off dead-arm coaches, the spring show moves to Bright House Field Sunday for the start of the Grapefruit League season. Sunday, the Phillies will host a scrimmage against the University of Tampa team that beat them last spring on a seventh inning grand slam off Hector Neris. The Spartans posted an overall record of 47-15 last season and were the 2015 NCAA II National Champions. The Williamsport’s Andrew Amaro went 1 for 3 in the game and figured prominantly in Tampa’s rally. He hit .320 for Tampa in his senior season. Monday the Phillies will hold their annual spring golf outing. The Phillies open their Grapefruit League schedule with a home game against the Toronto Blue Jays on Tuesday, March 1st. For the past week, the players have started with running drills and PFPs after stretching and calisthenics in the outfields. When the team split into groups for field drills, I stuck with the first-team infield – Ryan Howard, Cesar Hernandez, Freddy Galvis, and Maikel Franco with Taylor Featherston and occasionally Ryan Jackson. For live BP, the players break into groups of six or seven and are assigned to one of the four available fields where they wait for the pitchers who are scheduled to pitch and have warmed up on the Seven Mounds during fielding practice. I looked for interesting pitchers to watch, but always came back to Ashburn Field for BP off the coaches to watch Odubel Herrera, Maikel Franco, and Ryan Howard. When their shaggers came in to hit, I walked around to Roberts Field to watch Roman Quinn, J.P. Crawford, Brock Stassi, and Logan Moore. The completion of BP signals the end of practice for most players. But a small contingent took bunting practice over on Schmidt Field. This group included Emmanuel Burriss, Freddy Galvis, Cesar Hernandez, Aaron Altherr, Peter Bourjos, Odubel Herrera, Tyler Goeddel, and Roman Quinn. I had seen the catchers take BP during pitchers and catchers the week before, so I focused on Herrera and Franco. Both showed good power off the soft tossers. Franco cleared the left field fence often. I believe that most would have cleared even without the aid the wind provided. He bounced balls off the stadium wall and plunked the big trash compactor on several balls. Herrera is still hitting balls hard was able to hit several balls through the right-to-left wind into the cars parked behind the right field fence. Howard looked like Howard always does in Clearwater. He swings for contact while trying to groove his stroke. He squares balls up and hits them hard but doesn’t try to clear the fences. Quinn and Crawford aren’t as far along as Franco and Herrera. They hit some balls hard, but not as frequently as the other two. They showed a little more power today, but the left-to-right breeze might have affected some of their home runs. Brock Stassi appears to have sold out on each swing to clear the fence. His best path to Philadelphia is as a first baseman, so it would appear increasing his power numbers is a smart plan. Logan Moore is a defensive catcher who could probably make the majors as a back up on that alone. He is starting to show some better outcomes at the plate and could insert himself into the conservation for catcher in the post-Ruiz era if he continues to improve. I made sure to take in the bunting session so that I could watch Quinn. He really looked effective from both sides of the plate. Burriss was the best of the rest, and by a good margin. Goeddel was had good form for a guy as tall as he is. All three “catch” the ball with the bat rather than stab at it. Burriss may have had the best technical approach. Altherr was better than I would have expected the one time I saw him. It was pretty cold here on Thursday (yeah, like 58 degrees) so there was no live BP. I watched Brett Oberholtzer and Mark Appel pitch on Friday. Oberholtzer had a good session. He had good control of the pitches he threw and avoided solid contact by the group he faced which included Crawford, Quinn, Stassi, and Moore. Appel strides to the plate. Appel faced a group that included Jorge Alfaro, Nick Williams, Tyler Goeddel, Cedric Hunter, and Andrew Knapp. I don’t know if he has begun the transition from the 4-seam fastball Houston forced him to throw to the 2-seasm fastball that he was comfortable with in college. But, he seemed to leave his Fastball up around waist high, and the batters were making a lot of solid contact. Saturday, I saw Jake Thompson, Zach Eflin, and Vincent Velasquez. Thompson pitched against Galvis, Hernandez, and Asche. There were no radar guns available, but Thompson seemed to be at or near his top velocity. He had good control and limited solid contact. Eflin seemed to have less velocity. If Thompson was around 93-94 mph, then Eflin was around 90 mph. He had good command though, and pitched well against Franco, Herrera, and Howard. Velasquez was on the adjacent field and was toying with a group that included Darin Ruf, Andres Blanco, and Darnell Sweeney (I think). Ruf took a Velasquez fast ball to the left field warning track but was punished on the next pitch with a low-and-away off speed pitch that Ruf could only wave at. 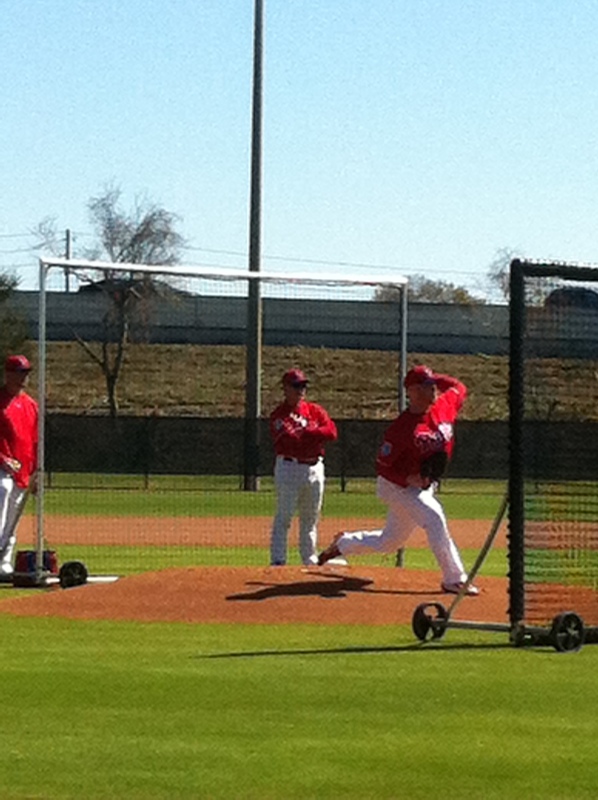 On Friday, I stuck around the Complex late enough to see a couple of the minor league early reports throw live BP. I think the first pitcher was Tom Windle on Carlton Field, but forget who started on Roberts Field. Both were completely over shadowed by the tall, lanky left-hander who followed Windle (?). I’m not some savant who can judge pitch speed just by listening (although, I think I can hear a curve ball, jk), but I judged that the lefty was in the low 90s. As his session progressed, his fast ball seemed to pick up velocity. I felt he had gotten to the 95 mph range. Then it clicked. 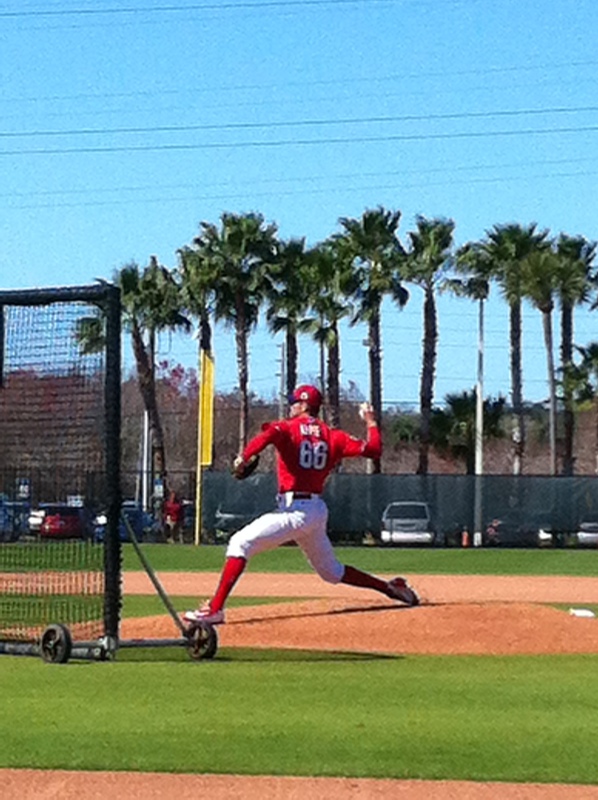 This must be the pitcher the Phillies signed out of the California Winter League. So, I asked one of the administrative types who was standing in the dugout who this pitcher was. He didn’t know. I asked two passing coaches/instructors, they didn’t know. So, when his session was over, I asked the pitcher as he walked past me, “What’s your name?”. He replied Evan. My first thought was of the Brazilian soccer team that only goes by their first names. However, I extracted his last name and talked to Evan Crower for a few minutes. I don’t want to get you guys all excited. He was pitching against mid-level minor league batters. But, his fastball was hard and low in the zone. He had an off speed pitch that dropped about 8 inches and away from left-handed batters. And, only one ball was struck by a bat, a weak chopper, foul toward the first base dugout by a right-handed batter. Looks like another NDFA find by Phillies’ scouts. With the start of Grapefruit League games, the practices at the Complex will be down-graded somewhat. Some players will take BP at the Complex, but operations there will begin converting to minor league spring training. Their official report date is March 3rd. They begin minor league play against the other organizations on Tuesday, March 15th. The Single-A Phillies will play a game against the Canadian Junior National Team on Sunday, March 13th in St. Pete. Tell the kiddies to get theur Evan Crowder basevall cards while they can. :-). Ita a really good writeup. Nice write up tks Jim I was wondering how Featherston looked since he is one of the newbies . I wonder where Crower. Will start maybe instructionals. ‘My first thought was of the Brazilian soccer team that only goes by their first names.’…now that is funny. I’m glad you braved our really cold weather (while some of us snuggled in warmth) so you could give us reports. I’m amazed no one knew Evan Cower, I think the scouts should be alerted this guy is in camp. I guess he didn’t have a radar gun on him if you had to listen to the speed of the pitches…lol. Good job reporting again. From Linda. maybe you can get Mr. Crower to sign a baseball for you in the “sweet spot” now before he realizes how valuable it might become someday. He was a pitcher at St. Augustine High School in San Diego, Calif….a very pedestrian or average HS pitching record so football was a good evolution for him at the time. Should have figured you were on this long ago. Thanks. Sounds like a fun signing. On the U of Tampa site checking out the game. Knapp knocks in 2 as the DH. Phillies finally got their web cast up at 1:28. Knapp played the last 3 innings at 1st base.